Nortel VoIP phones represent the next generation of business phones from a world leader in business telecommunications. Nortel i2000 IP telephones are a a cost-effective IP deskset offering specifically optimized with values and features. The Nortel i2000 (Phase 1) IP Phone Series Portfolio consists of the Nortel i2001 IP Phone, Nortel i2002 IP Phone, and Nortel i2004 IP. The Phase 1 Nortel i2000 IP Phone Series features include an ergonomic and advanced design, high-quality handsfree speakerphone, and character-based displays. The IP Key Expansion Module for the Nortel IP Phone i2000 Phase 1 Series is an accessory that can be added to the Nortel IP Phone i2002 and i2004 models. The i2000 Phase 1 Series Nortel Internet Telephones are supported by multiple Nortel Networks communication systems, including Business Communications Manager (BCM), IP-enabled Meridian 1 and Meridian SL-100 systems (with Internet Telephony Gateway cards installed), and Succession Communication Servers. 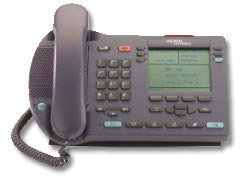 Click below for more information about each model of Nortel's i2000 Series VoIP phones. The Nortel i2000 IP Key Expansion Module (24 key LCD KEM) can be added to the i2002 Phase 1 IP Phone and i2004 Phase 1 IP Phone. The i2000 Series LCD KEM is a 24-Key programmable, self labeling LCD expansion module.